Immigration to any country demands thorough preparations and information update. Canada being the most desired country for the immigrants from Asia is no exception to this statement. Every year, mass immigration to Canada from India, China, Philippines, Pakistan, etc. countries is typical. If you are one of the Canada immigration aspirants from any of these countries, you must be uncertain thinking whether you would be able to follow the immigration process of Canada or not. This uncertainty has been raised more among the aspirants since Canada switched to point based immigration system in 2015. All the new terms introduced have confused most of the aspirants, such as Comprehensive Ranking System, Expression of Interest (EOI), Express Entry Draws, Provincial Nominee Programs, etc. 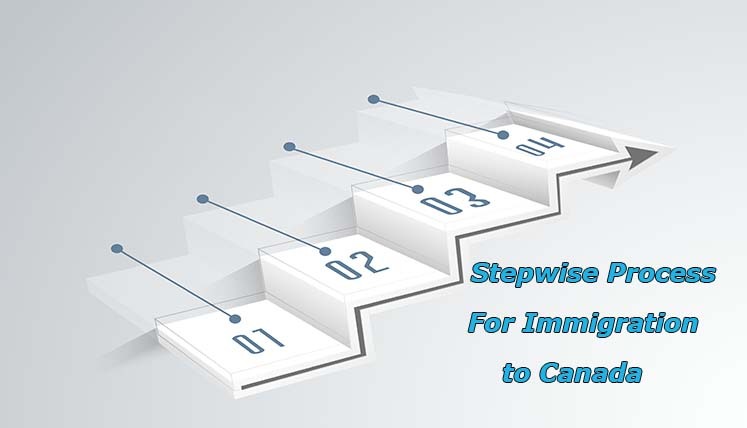 What is the stepwise process to follow for Canada immigration? If you follow the stepwise process, there is nothing to be uncertain or hesitant about Canada immigration process. Here are the key steps you can follow for smooth immigration to Canada. The first step would be to decide as to how you want to about immigration to Canada, i.e. whether you want to apply on your own or need help from a immigration consultancy Service. If you know the Canada immigration process, terms, and guidelines, you can apply on your own as well, since the process is online. On the other end, taking help of a certified Immigration expert or registered Immigration Consultancy Service can also make your pathway smooth and trouble free. If you apply through Canada immigration Consultancy, you can get help in online process, documentation, visa filing, and follow up of the visa with immigration office. Many a times people busy in jobs don’t get time to follow the whole process, in such a scenario, Visa Consultancy play a vital role by reducing lot of your pain in understanding and following the process. If you are applying through a reliable Immigration Consultancy for Canada, this task becomes thoroughly easy for you. You get vital help from the consultant in understanding the document requirement and preparing the immigration file after gathering all of them. Express Entry System is the most popular way to move to Canada for Skilled Migrants. It follows Comprehensive Ranking System, according to which, you are given a definite point score based on your age, education, language ability, work experience, etc. once you submit online EOI (expression of interest) in express entry. The EOI includes all above mentioned information for which you get a point score. You may also apply for Canadian visa through the Provincial Nominee Programs (PNPs) of the different provinces of Canada, i.e. SINP, AINP, OINP or via QSWP immigration program of the Canadian province Quebec. The IRCC launches draw every fortnight to select the top ranking profiles in express entry pool. If your profile is selected, you will get Invitation to Apply (ITA) from IRCC. Once ITA is received you need to submit visa application to immigration office attaching all the key documents along with the same. An Immigration Consultancy Service again plays a key role in helping you submit the visa application with complete accuracy, as incorrect application may result in delay of the visa or the denial at times, if the application is found inappropriate. Visas Avenue is prominent and registered Visa Consultancy Service for Canada that helps immigrants in hassle-free immigration to Canada. It has obtained Visa approval for its hundreds of clients over the years. To discuss your Canada immigration process and eligibility, you may call the expert at Visas Avenue on contact nos. 011-48447777, 011-46194650 (Delhi), 040-42467777 (Hyderabad), or 080-46668222 (Bangalore). Your immigration queries to email id- info@visasavenue.com are also get answered appropriately by experts at Visas Avenue. Why Canada is Better Immigration Option than the US at now? How to find the best immigration consultant in Delhi?